9/19/18- KUA @Holderness vs. The Lakes Region League: The boys take 2nd place and the girls take 4th place! Kimball Union Academy attended their first race of the season at Holderness School against eight teams for the boys and seven teams for the girls. The other boys teams were: Holderness School, Brewster Academy, Tilton School, Vermont Academy, Proctor Academy, Cardigan Mountain School, The White Mountain School, and New Hampton School. The Boys cruised to a second place finish with a score of 46. (Four boys were scored with one displacer.) KUA’s top seven finishers were: Nathan Brooker (18:52, 6th place), Alisdair MacPhail (18:56, 7th place), Kohki Shinohara (20:32,14th place), Jonathan Bruner (21:17, 21st place), Anthony Solt (22:48, 46th place), Noah Farnsworth (23:13, 48th place), and Benjamin Conway (23:51, 55th place). Dillon Harrington (24:57, 63rd place), Declan Clark (28:14, 79th place), and Alastair Man (31:54, 99th place) also had excellent first races of the season. 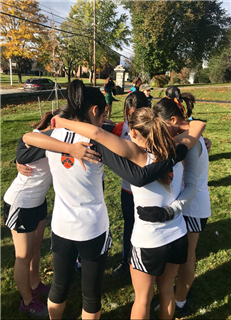 The other girls teams were: Holderness School, Brewster Academy, Tilton School, Vermont Academy, Proctor Academy, The White Mountain School, and New Hampton School. The girls secured a fourth place finish. (Three girls were scored with one displacer.) Eleanor Ashton (22:00, 2nd place), Rachel Xia (27:33, 21st place), Nancy Tran Nguyen (27:34, 22nd place), Ellen Hu (30:06, 28th place), Kate Gao (30:37, 33rd place), and Olivia Xu (31:42, 39th place) all had strong finishes. The team will return to action next Wednesday with the first home meet! The early results indicate great potential for the season!